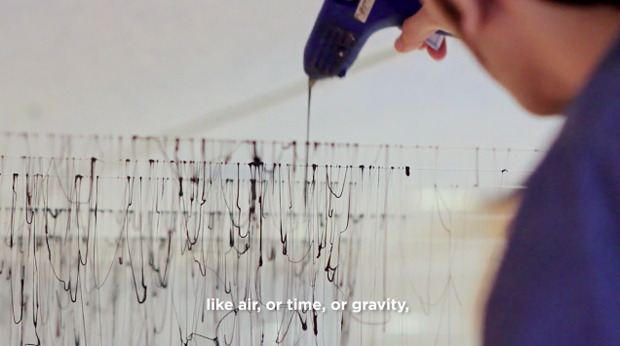 As many of you may already know I’m quite a big fan of the filming style of Mark and Angela Walley, I’m just glad they’re equally adept at sourcing out some really innovative artists like Yasuaki Onishi who features in this film of theirs that I’m sharing today. I’ve not come across Yasuaki before but I was taken aback by his installation in Houston’s Rice Gallery which explores the idea of gravity in a visual form, I just wish this was being shown in London as I would of loved to have seen it up close and personal. Reverse of Volume, the title of the exhibition, has been running since yesterday and will conclude on the 24th of June so if you’re in the Houston area I’d recommend taking a visit across to the Rice Gallery. Artists typically use inexpensive materials to create stunning works of art at the gallery and Yasuaki’s work is no different, combining simple plastic sheeting and hot black glue to create his mountainous like form. As you will soon see in the film below the artist stacks boxes at different levels which forms an impression in the sheeting once they are removed, leaving behind a negative space or void which can be walked underneath and around by the viewer. At the beginning of the film I must admit I didn’t expect the final impact of the installation to be so significant, once the boxes are stripped away and just the free hanging creation remains it’s really quite the spectacle. This piece was the fourth short documentary that the Walley’s have completed for the Rice Gallery so hopefully we will see more interactive type art cropping up on their own website in the near future. If you’d like to read more on the Japanese artist his own website is perhaps the best place to start, so along with the Walley’s page I’ll link this just below.